Our SoundCloud Extras plan is designed to boost the SoundCloud Likes, Repost and/or Comments on any SoundCloud track. Whether you want to give your track a kickstart in engagement, encourage others to likes and comment, or counteract negative engagement — we can help. All orders are started within 24~48 hours and are delivered at a natural, organic pace. 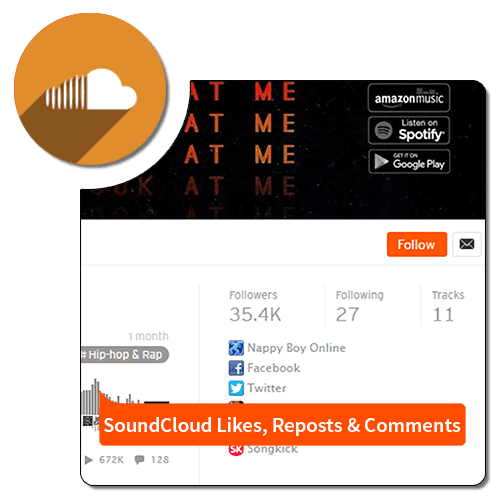 Our SoundCloud Likes option will guarantee likes on your track by promoting your track within our private network of verified SoundCloud users. Plans range from 100+ Likes, a small kickstart, to over 10,00+ Likes for a prominent and powerful boost. Our SoundCloud Reposts option guarantees your track will receive a minimum amount of Repost from users around the world. Plans range from 100+ Reposts to 1,000+ Reposts. With repost, you’ll not only gain more social proof but also get some social buzz, attract more listeners and improve your track’s ranking on Google and SoundCloud search results. Our last service option is SoundCloud Comments. You can purchase as little as 10 SoundCloud comments for your track, or as much as 100 comments delivered over the course of a few weeks. All SoundCloud comments are high-quality, delivered by real authentic SoundCloud users, are always in English / English Slang and are positive and encouraging. We can either have users themselves write comments for your track, or you can provide us with your own custom comments to ensure you get exactly what you want. Note: This service is for SoundCloud Tracks only – 1 Track per order.